Daryl asked about my "new" job. I Met wonderful people at work on December 20, 2007 , but on the 26th, I got a better paying job offer from my former employer. So I decided to accept that instead. My last day as a housekeeper was on the 28th. 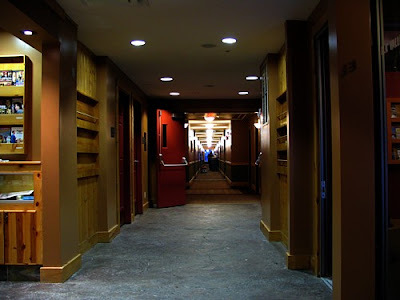 This is a photo of one of the 3 long hotel corridors where we had to clean the rooms. It is a great job for cleanaholics. Gives me lots of work-out! The time runs fast. This morning the phone rang. It was a call from my dear friends Antot, Marvinn, Qryz, Dindo, Paulo in Baguio, Philippines! I am happy because I got to chat with 6 of my friends in a phone call! Just wonderful. Makes me feel Philippines is not so far away. Thanks for the call! Really appreciate it! so what's you job na? haha, ang cute mo naman, bagong gising??? A Bunch of Lies - Just Delete It!